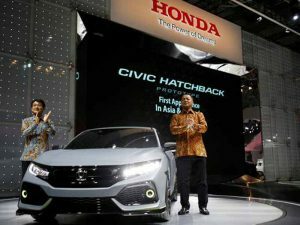 JAKARTA — Japanese car maker Honda Motor jumped to the No. 2 position in Indonesia’s auto sales last year, shouldering out Daihatsu Motor, which had been the runner-up for seven years in a row. Honda sold 199,000 units throughout 2016, slightly more than half of the sales recorded by market leader Toyota Motor, another Japanese automaker. But while Toyota’s sales grew by 18% to 381,000 units, Honda’s rose 25% — the highest increase in the industry. Daihatsu’s sales rose 13% to 189,600 units. The top three car makers’ growth easily beat the rest of the industry, most of which reported declines in sales. Indonesia’s total car sales expanded nearly 5% last year to 1.06 million units, a recovery from two years of consecutive declines in 2014-15. The market shares of Toyota, Honda and Daihatsu are all estimated to have risen to 36%, 19% and 18%, respectively — from 32%, 16% and 17% in 2015. Total market share of the three Japanese makers accounted for 73% in 2016, up 8 percentage points from the previous year. Honda, which was in third place in 2014-15, attributed the jump in its sales last year to the launch of several new products, including the Honda B-RV. The sport utility vehicle finished second in the number of units sold after new Honda Mobilio, a multi-purpose vehicle. Jonfis Fandy, Marketing & Aftersales Service director at Honda Prospect Motor, the Indonesian unit of the Japanese automaker, added that sales were also supported by the expansion of dealerships. Honda ran 167 dealerships across Indonesia last year, and aims to increase that figure to 205 in 2017. “With the economy projected to be conducive [for growth] in 2017, Honda is optimistic about further increasing our sales,” Fandy said.